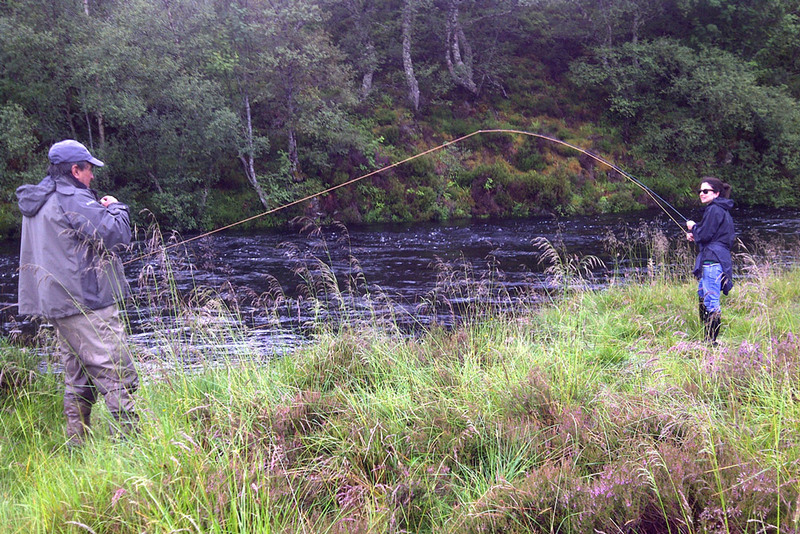 No matter how experienced you are, nothing can replace 'local knowledge' and we can provide professional guiding and ghillie services on numerous waters throughout the Northern Highlands to optimise your opportunity to catch fish. 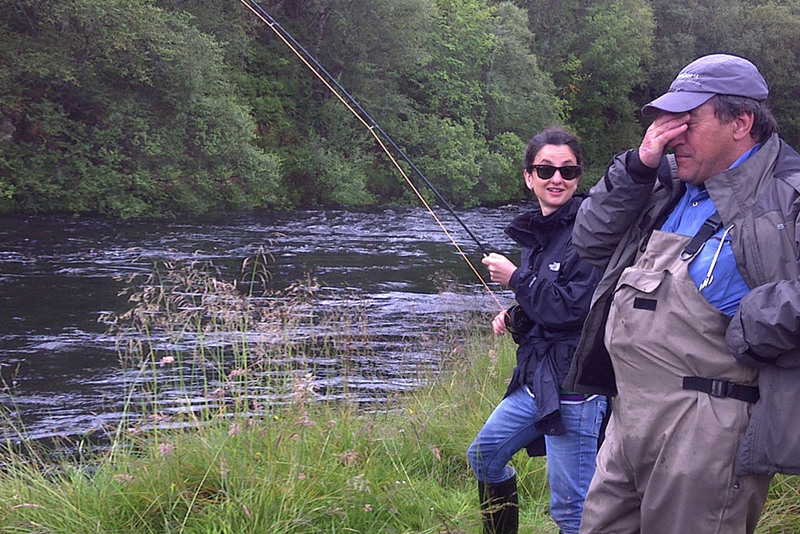 For experienced fly fishers visiting the area, we offer full day guided excursions locally to fish for trout or salmon. For beginners we can split the day to begin with some formal fly fishing instruction, then follow that with a wild fly fishing experience. If you are staying nearby, we can collect you from and return you to your accommodation. 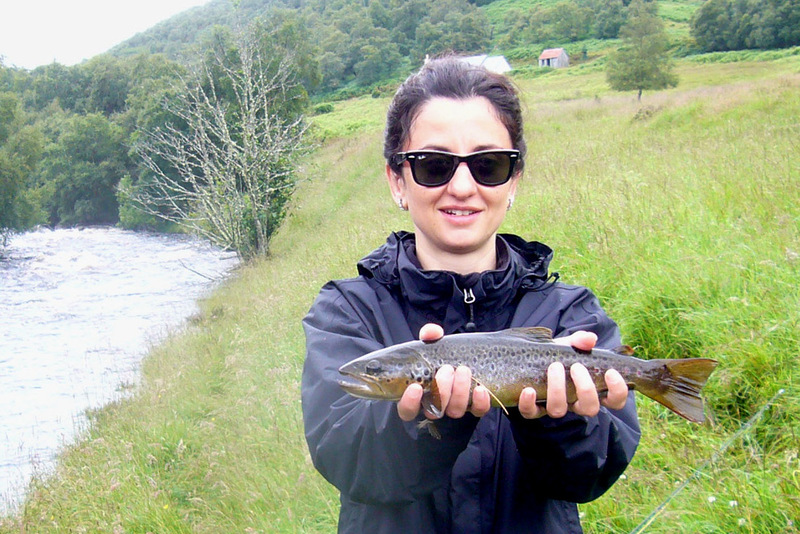 All of our local trout waters in Easter Ross are detailed in the Trout Fishing section and are easily fished in a day excursion. All trout lochs where we have our own boats, and most of the other lochs and rivers where we have private arrangements to fish, lie within the area marked in pink on the map below. In addition we commonly also use various lochs in South-East Sutherland, Strathconon and Strathglass for day excursions. 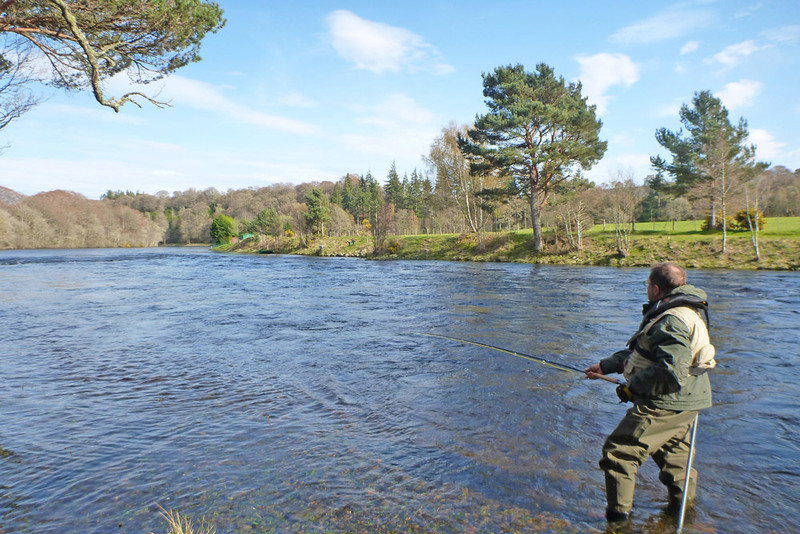 For salmon fishing in the summer, we offer most of our experiences on our own beat of the River Alness, but we also visit other local rivers, particularly in the spring, including the Conon, Beauly, Carron, Cassley, Ness, Moriston & Findhorn. The map also shows the locations of some of our favourite day trip and excursion destinations. While some can be fished on a day excursion, staying locally overnight significantly increases the amount of fishing time available. The lochs of Assynt can be reached in under 1½ hours, those of Caithness in 1½ to 2 hours and the Durness lochs in 2+ hours. Excursions to Orkney should really be considered for a minimum of 2 nights, as the travel time to/from Evanton is 4-5 hours including the ferry trip. 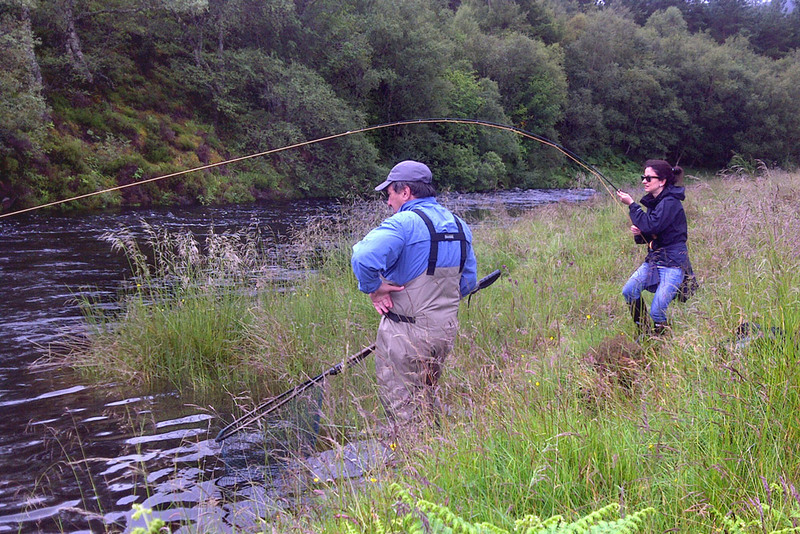 For the passionate and discerning trout fisherman determined to fish the very best wild brown trout lochs that mainland Britain has to offer, we can create multi-night fly fishing adventures throughout Wester Ross, Sutherland, Caithness and Orkney. Of course not every fishing excursion is successful, even when guided. 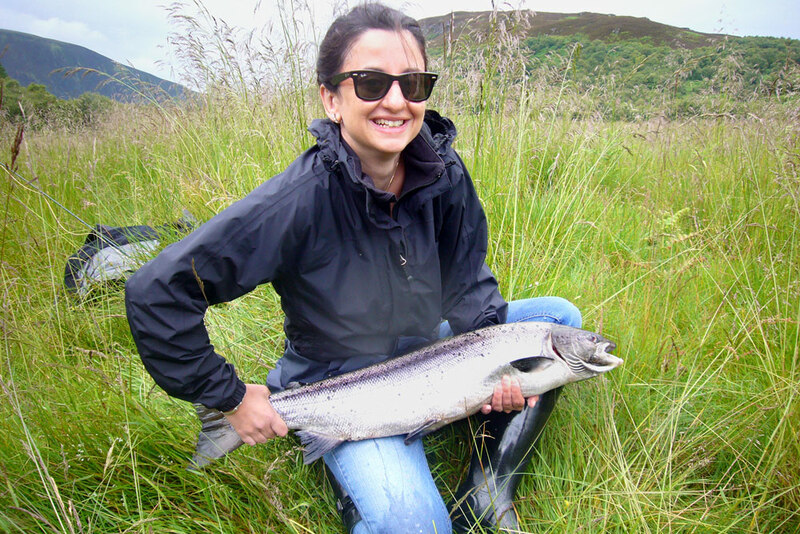 Atlantic salmon are renowned as being one of the most difficult fish species to catch, as they do not feed when they return to freshwater, so a 'first salmon' is a real achievement. 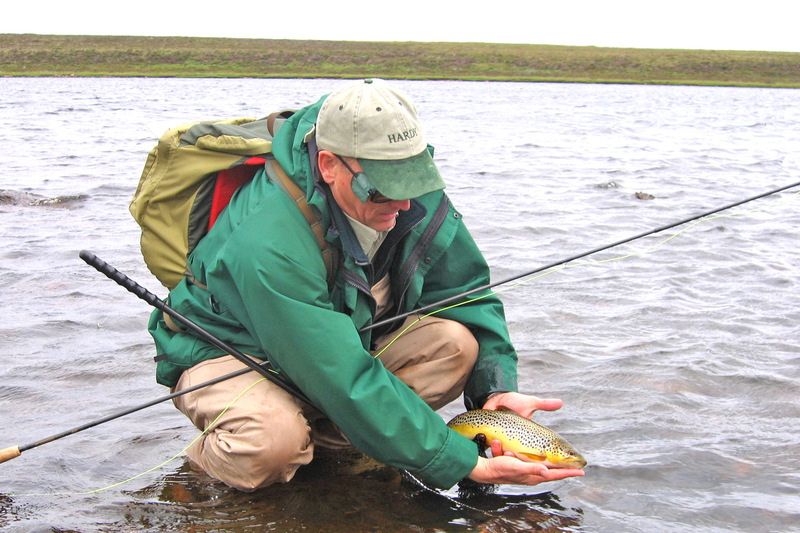 Wild brown trout can also be fickle when conditions are unfavourable, and so even our trout fishing trips offer no certainty of success. We are in trouble! We need a bigger net! Who's playing who? On the bank! 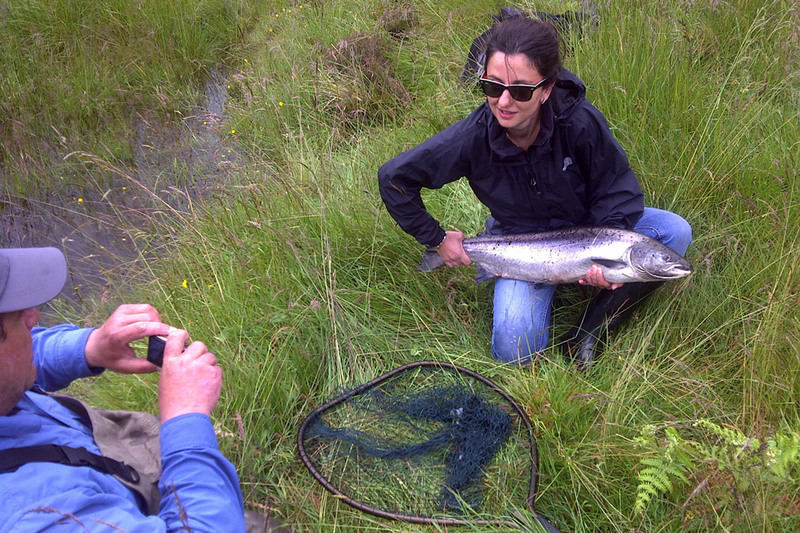 Rachel's 1st Salmon!